Pooran Panwar's Moves on Movies .... | If entertainment of few hours is not the sole reason for you going for a movie then You are gonna like this space !! ! Pooran Panwar’s Moves on Movies …. If entertainment of few hours is not the sole reason for you going for a movie then You are gonna like this space !! ! This is exactly how I feel about this movie if I am asked to review or judge this one. This is certainly not an exploding piece of cinematic excellence nor it’s a cent percent entertainment pill for us. So like this maidan which is beyond sahi and galat, this movie makes its way to your heart but you don’t feel a void after watching it . It seems like Imtiaz Ali tried to be direct (in first half) as well as subtle (in second half) at various phases in the movie which kind of got me confused which genre I should tag this movie to . If there is a reason to watch this movie , its Ranbir and Rahman. If you are one of those who can appreciate the finesse of acting and screenplay even when the total package is not that great, I bet you will truly enjoy it. 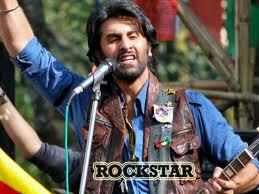 Rahman’s music is like a supporting actor in this movie playing Ranbir’s best friend role . You will find it always with Ranbir when he is happy, depressed, angry or frustrated telling us the true emotional journey the protagonist is going through – just like a best friend. So its not just music it’s the personification of the characters protagonist play. Its been quiet a time since I posted my last blog and after watching this movie it would be a crime on my part to not write about it . I go to watch this movie yesterday with no pre-fed reviews on my mind and any remote association with the background of this movie . Lucky me , didn’t know that I will catch one of the best movies like this which is still growing on me. This is one of the best things which has happened to Indian Cinema . Amol Gupte (The Director) who was the scriptwriter and creative director of “Taare Zameen Par” has shown to Indian Cinema how theater and main stream cinema can be mixed to offer one of the most heart warming movie of 2011. It has a simple story which will take you to wonder days of your school and remind you of your school buddies who will always stand by you and treat you like a hero, your Rosy Miss who loves her students like her own kids and makes your day every day with her “rise and Shine” smile , the khadoos teachers who teach for the sake of feeding their stomach and ego (may be losers is a better word for them) . Amol has used very routine things in school life as a skeleton of the story to showcase much broader things like the Bonding among friends in school, the limitless imagination and sea of creativity they have , the current pedagogy and the teachers who can kill the child in the children. As i am not reviewing the movie here , very shortly, the characterization in the movie is brilliant with both Stanley (Partho, Amol’s son in debut ) and Verma Sir (Amol himself) giving a life to their character . The best part is the story paving the way for its ending , catching you totally unaware , hitting you hard and leaving you poignant with a lump in your throat. So far one of the strong contenders to go for Oscars from India. PS : It took Amol nearly two years to finish this movie as making movie was never the intent out of the workshops which Amol used to conduct to teach theater to the school children from his Alma Mater. First let me clear the air that Guzaarish is not a bad movie at all , will throw light on the parts which were good and the pieces which could have been better in next post. This post is to vent out my anger at the reviews from the established movie critics who have labeled this movie as a piece of work from an aesthete and a melodrama based on three masterpieces – “The Prestige”, The Sea Inside” and “The Diving Bell and the Butterfly” . I don’t remember a single review where critics missed mentioning these three names and going overboard on these flicks than reviewing Guzaarish. It was as awkward as a bikini clad women would be in a Gutkha Ad. The only similarity Guzaarish has with “The Prestige” is the lead actor being a magician and having a rivalry which proved to be fatal. The other similarity Guzaarish derives from other two movies is lead actor being in “locked-in Syndrome” or “being a quadriplegic” and fighting to end his life. Are these justifying enough to call this piece of work as the derived one. Off course not , else why would we fall for war movies with same war most of the time , movies with same plot of Nazis killing the Jews and movies capturing it from defferent angles (or perspectives). If audience writes off the movie which pre-exists in same or other form, then these three movies would also not have had the followings they demand today . “The Prestige” is completely based on Christopher Priest’s novel of same name, “The sea inside” is based on real life story of a ship mechanic who fought for euthanasia for 28 years and “The diving bell and the butterfly” is based on the memoir of the same name. In my view, most of the reviews are done on the barometer of fun , masala and entertainment factor which can help folks to quickly decide the combo – movie A + Popcorn + killing next 2.5 hours or movie B + popcorn + killing next 2.5 hours. To make the research look more authentic, the critics would drop 2-3 hollywood names to claim he knows what is he talking about …. I would have loved if a single review has captured the attempt of the director to tread a new path which most of the new age directors fear to walk on. The beauty was in the attempt . You gotta read my second post on Guzaarish to know about my personal views . I was checking Ryan Gosling’s history on IMDB being impressed with his performance in “Half Nelson” when the site showed up other movies he is known for. 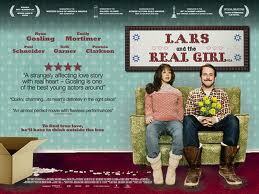 As I was not in a mood of heavy drama , I put my hands on “Lars and the Real Girl” , frankly it’s the name which got me excited and when i can risk putting my money on IPO on gut feeling, this habit is risk free. That was the reason to pick the movie but certainly not for dedicating this piece of writing for writer Nancy, director Craig and actor Ryan. The beauty of the movie is the story which can be just considered as thought for being so simple and so minimalist. Its about a delusional young person who develops an unconventional affinity for a doll and how everyone close to him get along with this false believe to help him come out of this believe. As story is so subtle and pure, its very critical to maintain the same feeling among audience throughout the movie and this is where director Craig has done a brilliant job. The movie has its bits of humor and pensiveness in between but handled carefully to ensure they don’t adulterate the feeling which is instilled right from the beginning. Ryan is awesome , again very unconventional role played beautifully and i guess our own Abhay Dheol is treading the same path. Its difficult for me to give a Genre for this one, both Drama and Comedy don’t define it. You might end up being confused reading this post, but I recommend this movie to those who want to see a movie which is so gentle and pure that you don’t like the movie but you love it. Probably “the painted veil” comes close to it if it needs to be compared with one. The fear of using the three letter word in my post is not the reason I did that tweaking in the title, I thought let me reveal the essence of the movie in the title . Oh no.. ….the movie is not about how to improve on your grammar or enhance your reading comprehension,no not at all… its about the beginning of contemporary cult classic new age cinema in bollywood :-).. oh so heavy…please wake up and read on.. If i have not told u earlier, i am a big sucker of western and world cinema , specially Spanish, German and French as each of these movies creates a new genre for audiences who have developed taste buds for “something new”. The “experimentative mindset” has stepped in bollywood also and is still in its infancy as we as an Indian audience would still like to see a superstar, a superman and a utopian world in those 2-3 hours which we can never be or achieve in real life. We pose a lot of challenges for people who dare to produce, direct and execute the concepts never done before. 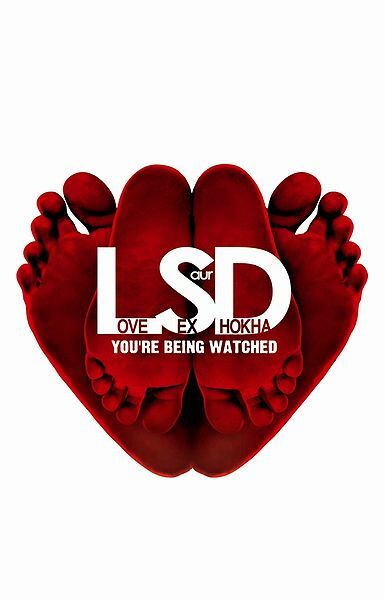 LSD is one of those experimentation Dibakar Bannerjee has done who should now be referred as the curator of this trend in bollywood. It was the real middle class story in Khosla ka Ghosla, the uncanny dialogue delivery and screenplay in Oye Lucky Lucky Oye and the sheer cinematography and the very concept in LSD which establishes DB as a man who knows cinema as a cinema more and business less. I think LSD will go down in the history of bollywood as a classic, cult or contemporary cult. Why do I think so .. well first is its cinematography , the movie has been shot to appear like recorded digital tapes of handheld , CCTV and Spy cameras. Though it goes well with horror as theme like we saw in “blair witch project”, “cloverfield” and very recent “paranormal activities”, but with voyeurism as theme , cinematography is the soul of this movie. Moving to the story part, the way the three words in the title sums up the three stories running parallel in the movie and are interlinked towards the end, reminds me of the trend set by Alejandro González Iñárritu with movies like Amores Perros, 21 Gramas and Babel. Again , if not at par with Amores Perros, but a brilliant start with LSD. Then there are actors who are not acting in front of the cameras, the characters with uncanny dialogues which makes LSD more and more watchable. If you love real cinema , here is one masterpiece of modern times. It was like Sas Bahu serials’s concsecutive three times “KYA” moment for me when my dear friend for last three years ditched me . I am talking about mininova, who has been serving the people like me who prefer torrenting the movies than watching them on DVD or at theatre , specialy if its English, German, Italian,French and Spanish. When i was away from mininova for the last 45 days, little did i know there are other friends like thepiratebay which i never knew existed. So on saturday i got this movie downloaded (thanks to thepiratesbay which is far better than e-bay as you dont pay 🙂 ) and watched it as first thing on Sunday morning. I have penchant for world cinema and being german i was expecting this also to be more of drama which i am big sucker of, but poor me i was wrong as the next 80 mins proved to be maggy sauce – its different . This movie is a bolt from the blue !!! Trust me , i have watched all kinds of wired movies (which are nicely called cult movies) and any new genre, concept doesn’t surprise me easily, but this movie totally swept me off my feet and german cinema has become more dearer to me. The last i luved was – Das Leben der Anderen (the lives of others). I won’t go reviewing it , just an honest confession that i have never come across such wierd concept or i would rather say experimentation with human minds earlier and which i have liked each and every bit of. The concept is , there runs a story about a girl and a boy where girl needs to accomplish “Something” in 20 mins to save her boyfriend’s life and the run-length also is near to 20 mins. After 20 mins , the story ends with some “ending” to it and you throughly enjoy what she does in those 20 mins and what all happens to her. So what after 20 mins… wait, wait ….here it comes… the damn thing starts all over again, yes it starts all over again … with same girl, same boyfriend, same situation… with only change in the situations in those 20 mins and those different situations culminating into a differnt ending. The second ending is totally different like again maggie sauce with diffetent flavour. If you are intelligent like me and remember that i told you its 80 mins flick so there got to be some more to it …. right . Yes there is, there is the same situation again – ” The Third Time” where everything remains same but the diffferent situations and ending. So it came across to me like a video game where i am given more than one chance to play the game. I thanked that minute when i chucked the idea of doing abit of research on the movie before watching it , like genre, star cast and two line summary. Had i done that, i woulnn’t have mustered enough courage to dedicate 80 mins of my sweet sunday morning to such crazy concepts. Trust me all those who like something “different” in cinema will luv it. It has got three endings for same story , you can pick whatever you like and feel good about that but someone like me would like it more for the reason of thinking – how on earth can someone even think about these concepts which are more astonishing than the concept casrs shown in Auto Expo (sorry.. bad one). Can you tell me the story in three sentences? This is my question to all those who saw “Wake up Sid” ? I sat through the whole two and half hours of movie , totally captivated and to my surprise , when I was speaking to my friend on the story part, I took not more than a minute to finish it. This is what we call a minimalist plot which is the beauty of this flick. I heard people comparing WUS with Lakshya, but for me it has very less resemblance with Lakshya. The only resemblance is the aimless life of both the characters. If the essence of the movie is to be compared, then both the movies are pole apart and the only commonality is the fresh direction. If I were asked to draw parallels, then frankly it reminds me of Richard Linklater’s 1995 drama film “Before Sunrise” (and “Before Sunset” – sequel). It’s a minimalist plot where two strangers meet , they travel in train, disembark in Vienna , , discuss on love , life, history , architecture, try to know each other and then they depart at the end of the movie to meet again (in the sequel ). It has no twist, no climax and no out of the blue ending. It takes the us on a journey called “your life” wherein we get immersed in the movie , identify with the character, live through the whole movie where each dialogue resonates with the conversation we have everyday and it ends just like any other day in our life. Also , I read somewhere that it’s a story of a spoiled brat who finally wakes up and realizes what he wants to do in his life and shoulders the responsibilities. Frankly, this part of the story was over much before the intermission and this is something which won’t appeal much –not to me at least. The beauty of WUS is in Sid’s and Ayesha’s realization of their love for each other which is a culmination of staying together as friends , confronting on many occasions but not accepting , fighting on trivial issues and many occasions of compromising for each other. This part of the story has a fresh as well as mature look. Fresh is because it was never tried before as most of our bollywood movies show us something which we call un-natural just to entertain us and mature because every part of the movie tells an untold story – even if it was a just a scene of hugging. This is the movie to get immersed in, to feel and live through and yes not to write about as words can’t describe everything. I salute these new age directors – Ayaan and Farhaan who are trying to give a new meaning to cinema in our country. I have woken up, have you ?